Unapproved personal knowledge is a meme-buster. If you are not sure why I say that think of the images of the South Carolina flooding and then attach the descriptions of “freak weather-related” vs “caused by climate change.” One affects us emotionally and makes us want to do something. Known, unassigned stores of fact can destroy a given narrative. Let’s use two examples from just this past week. Has anyone seen a picture of the Oregon shooter’s mother? If we simply got our news from the evening networks, we would not know the mass murderer was mixed-race, just like our first Black President. Facts in the way of the narrative. Part of the research into the sequel to my first book Credentialed to Destroy means that I have had to become an expert on Big Data. Let’s just say I have a lot of unapproved, demonstrably true facts at my command. So when this video https://www.oreilly.com/ideas/haunted-by-data came to my attention as a touted solution, I immediately knew it was a tactical keynote. The speaker misstated the nature of the problem to get a solution authorized that would actually make the problem of personalized data even worse. Words to the Wise: with behavioral data, it is the ongoing flow that is crucial to insights that allow neurological rearranging. Remember we have Learning Progressions to stipulated outcomes or Competencies. Once there and locked into place at a psychophysiological level to prompt and guide future behavior, the Oligarchs do not need to keep monitoring. Like Stiglitz, this is a group of people interested in redesigning and planning a ‘fragmented system’–this time in the name of those who want a credential that will guarantee them a good job. 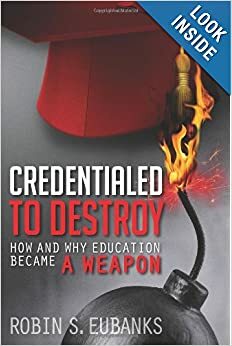 Once again factual knowledge impedes the panacea being spun, but it is a chance to see Anthony Carnevale [see tag] as more than just the author of those Workplace Manuals for the Bush 41 Labor Department that still guide the admitted to vision now of K-12 education as workforce training. We get to see how much former governors just love to go to work for trade groups pushing a politically planned economy or education reforms. Even former Prime Ministers like Gordon Brown find post-office full employment via the Rise of the planning Oligarchs. Last week the GEFF connected advisor Tom VanderArk linked to the final version of the Bipartisan Convergence Center’s vision for us. http://education-reimagined.org/wp-content/uploads/2015/09/A-Transformational-Vision-for-Education-in-the-US-2015.09.pdf It is just full of both false narratives justifying the need for transformation, as well as true declarations of intentions to change the children so that they are adaptable to the kind of changed social and economic systems Stiglitz and the Lumina Foundation (that called for the Credentials Convening linked to above) had in mind. In that planned, collectivist economy and society that still intends to use nonprofits and private companies to fulfill “the needs” of the people, unauthorized knowledge is in the way. That report explains how the “learner-centered paradigm for learning functions like a pair of lenses that offers a new way to look at, think about, talk about, and act on education.” I bolded that part of the phrase because the ‘pair of lenses’ analogy is what the last post said was a means of framing an individual’s orientation at an unconscious level. Unapproved, personal facts get in the way of our simply putting on the prescribed ‘pair of lenses’. That report confesses the intention to use K-12 education to prescribe the specific core knowledge, skills, and personal dispositions ALL students are to internalize. Did any dictator in history ever aspire to more intrusion, unless we count keeping everyone but a designated elite (the oligarchs) completely illiterate? Complete illiteracy is easy to notice. Prescribed ignorance, tied to useful false beliefs and regularly manipulated emotions, and then all coupled to doled out allowed core knowledge and practiced, approved behaviors, is what we are really looking at here. Unapproved knowledge impedes the Rise of the Oligarchs in our Vision 2030 UN-led world and it must not be allowed. http://www.iclei.org/details/article/advancing-sdgs-at-the-local-and-subnational-level-input-to-un-negotiations-on-post2015-development.html is a confession that the UN, mayors, city councils, and school administrators all know that most of the 2030 vision will be carried out globally at a local level. They have even coined the term ‘localization’ for this deliberate disguise for planned global control via local administrators and politicians. Sounds like what the Credentialing Summit is calling for as Seamless Pathways in a no longer ‘fragmented’ employment system. It would also fit with the communitarian, promote the Good of Others in daily behaviors, requirement that we found in the definition of Career Ready Practices. Let’s stay in the present for one more quote: “Additionally, this network promotes collaboration and communication amongst entities working to support learners’ health, nutrition, safety, and wellbeing.” Since those needs can only be met if the learners’ entire family also has their ‘needs’ met (see http://www.communityschools.org/assets/1/AssetManager/Better-Learning-through-Community-School-Partnerships.pdf ) , we are back to an obligation to meet such needs for all families with children. Just like Marx laid out, as well as the UN in that 2030 Vision all of our elected leaders signed on to about a week ago. I guess the last three are what is hiding in the present as those to-be-stipulated Dispositions. It will not be the individual student or any of the rest of us picking them out and, once again individual, unapproved stores of knowledge impede the plans. That is why UNESCO in 1968 called for “not a well-stocked but a well-organized mind.” Organized around the designated core knowledge, approved themes and concepts, and supplied principles and values–“it presupposes a certain limited sum of basic knowledge, deeply rooted and constantly available.” Basic knowledge that creates a “capacity for action.” That would be action though along approved pathways of course. Because broader problems should only be understood through the lenses of approved core knowledge. This ignorance and manipulated narratives of course greases the path for the Rise of the Oligarchs. Genuine, Unapproved Knowledge–the ultimate 21st Century Rebellion of the would-be serfs.